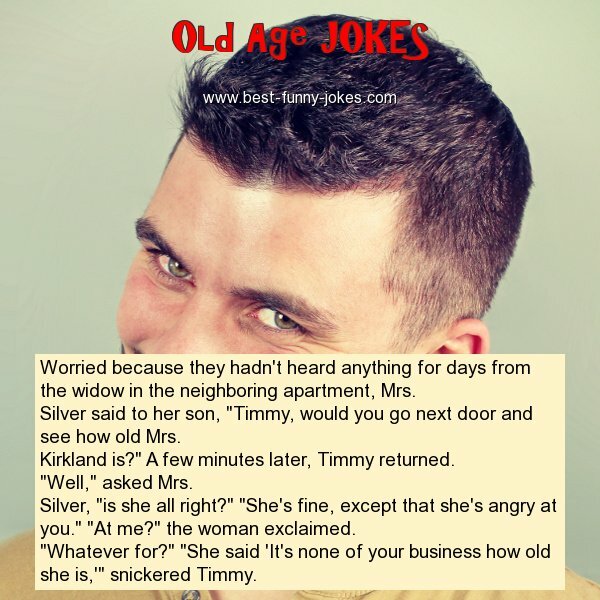 Worried because they hadn't heard anything for days from the widow in the neighboring apartment, Mrs.
Silver said to her son, "Timmy, would you go next door and see how old Mrs.
Kirkland is?" A few minutes later, Timmy returned. Silver, "is she all right?" "She's fine, except that she's angry at you." "At me?" the woman exclaimed. "Whatever for?" "She said 'It's none of your business how old she is,'" snickered Timmy.